If you want to download YouTube videos or download Facebook videos or videos from any of the video sharing websites, you will notice that these sites do not seem to offer a direct way to download videos. However, there are some easy workarounds that you can use to download video from Facebook or YouTube. Its no brainer to download videos from YouTube, Facebook or similar sites. There are numerous websites that offer options to download videos from YouTube and Facebook. However, most of them require you to install some or the other software. 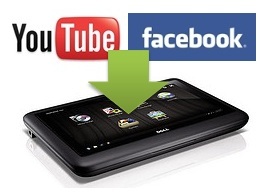 Here are two easiest ways you can use to download YouTube videos or Facebook videos at click of a button. This seems to be the easiest way to save YouTube Videos or videos from Facebook, DailyMotion, Break, MetaCafe, FunnyOrDie, Vimeo and many other video sharing websites. Method 1: Simply add “pwn” before the YouTube video URL such that the final URL becomes something like pwnyoutube.com/watch?v=abcd1234 and hit the Enter key. You will then be provided with options to download the video to your desktop. Method 2: You can use the bookmarklet from PwnYouTube. Simply drag it your browser links toolbar or save it to your bookmarks. Now, whenever you are on the video page of Youtube, Facebook, just click on the bookmark and you will see an option to right-click and save the video to your PC. This is a similar approach. But requires you to run their Java software. Method 1: Simply add “kiss” before the YouTube video URL such that the final URL becomes something like kissyoutube.com/watch?v=abcd1234 and hit the Enter key. You will be provided with options to download the video to your desktop. Method 2: Copy the video URL, paste it on KeepVid and click the download button to download the video. Method 3: Bookmark this Link or drag it your browser links toolbar. Then to download any video, go to the video page on YouTube or Facebook and click on the bookmark button. Note: When you wish to download Facebook videos, make sure you are using HTTP to access Facebook. HTTPS mode will not allow you to download the video. These options seem to be the easiest and quickest ways to download YouTube videos and Facebook videos. Wow. Thanks for this helpful tip.